As a part of Liverpool's strategy to secure several young players for long term, the club decided to extend its contract with midfielder Philippe Coutinho till 2020 from 2018. But the fact that Liverpool wasted no time in pondering over the decision underlines the importance and huge potential the Anfield club sees in this young Brazilian. Coutinho has proved to be money's worth for the Reds since his signing from Inter Milan in 2013 for 8.5 million pounds. Liverpool manager Brendan Rodgers has immense faith on this 22-year old to deliver the goods for his club. He sees in Coutinho a player who could become world-class one day and sees him shaping up in the lines of Luka Modric and Toni Kross of Real Madrid. Coutinho's abilities were there to see even as recently as the Capital One Cup encounter against Chelsea. 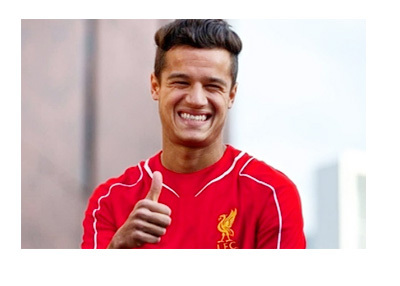 Although Liverpool lost 1-2, Coutinho was the stand-out player. The only real chances the Reds got in the match were created by this attacking midfielder. The 31st minute at the Etihad saw him on a dazzling run down the middle, easily getting past the Chelsea defense and unleashing a shot to keeper Thibaut Coutois's left which the lanky custodian somehow managed to keep out with the help of an outstretched foot. Another was when he completely wrong-footed defender Kurt Zouma and went for the goal and it was Coutois's heroics once more that saved the day for the Blues. He was again instrumental in last weekend's win against West Ham with two assists. His season's tally of assists is now up to four and he has also found the back of the net twice, figures that don't do justice to such a talented individual. Brendan Rodgers finds Coutinho a vastly improved player who is becoming more and more innovative in the midfield and developing a fantastic ability on and off the ball. Rodgers feels that once he can improve in the vital area of goal-scoring he sees the Brazilian up there with the best. If Liverpool's fortunes are to ascend in the remainder of the season, Coutinho's magical skills will have a major role play in it.